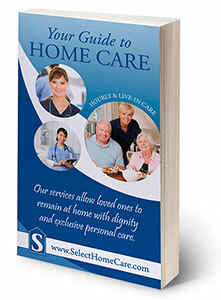 Your Guide to Home Care is a comprehensive guide to finding home care for your family or loved ones. We know it is not easy to find the quality care which is why this senior care guide is so important and essential for the future quality of life for your senior. We make finding and evaluating in home care options as simple as possible. Please download your copy today! Please fill out the below form in order to receive your FREE copy of “Your Guide to Home Care” eBook. Select Home Care is committed to helping you find the care your aging senior needs and desires.